Felix from Gurneys' Seed and Nursery prunes a four-year old peach tree and shares expert tips on pruning larger, older trees to facilitate better circulation, vigorous growth and maximum fruition. Hi, Felix with Gurney's here and we're looking at a peach tree today talking a little bit further about an older peach tree. Now we wanted to look, this is a great example of a well-managed peach tree where we have kept the height down with some pruning cuts, and it has really nice framework development. All those fundamentals we've covered with some of the earlier videos have been taken care of with this peach tree, just to illustrate the point upon pruning back and heading back cuts. Here's an example where we pruned last year, nice flush cut, that's starting to heal over, but what it did was it initiated... there was a bud there and it initiated a nice shoot break of fruiting wood here. So all this wood - that's nice pencil thickness - has flower buds all over it. This is a true gold here that we're looking at, true gold peach, and so there's going to be flower development. All on those shoots and when you look at this tree the examples of that one year, good vigor, all over the tree, and so what I want to cover today is I'm going to prune this tree up and I'm going to take out some of the density In the middle, so we can stimulate another batch of that vigorous growth and fruiting growth for next year on this tree, but also help the air circulation in the middle. So I'm going to do that and it will show you the outcome there to follow up with how to handle this tree further. So folks, see, I have finished pruning this tree. You can see that most of my cuts have taken out the volume on the interior of the tree, thinned out some of the clusters of branches on each of these scaffolds just to balance the fruit bud alone there, which is going to be our crop load, so we don't get breakage and better air circulation on the interior. A number of these cuts here are also going to stimulate growth and breaks, shoot breaking...It's going to be our growth for next year's fruit load, so really every year on a properly managed peach tree, this is all you have to do is come in and just clean up the center, downward growing branches, inward growing branches and then just opening up some of the density on these branch clusters, so you have good airflow and get sunlight penetration to the leaves. That's all there is to it, and if can stay on it every year, do this, it didn't take, hardly, it took five minutes to prune this tree. 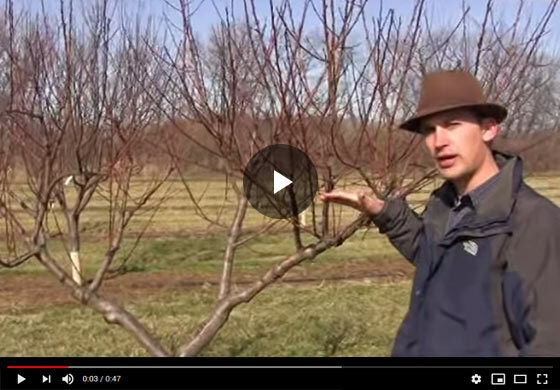 It's easy to stay on top of it every year and if you wanted to look at some of our care from previous videos, check out our first, second, third year pruning videos which we have on Gurney's, it'll help you have success with growing peach and other stone fruit.